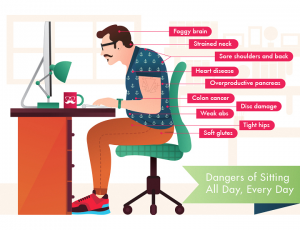 Desk disease Part 1: Crucial strategies on how to avoid it and live healthier! It’s Thursday afternoon. You are staring blankly at the computer screen at your office. Your mind is wandering to the weekend even though it’s still a day away. Slouched in your chair, shoulders rolled forward and your back is starting to ache. A mild headache is starting to kick in. A colleague walks by and asks if you want a coffee. ‘Ah that will make me feel better’ you think. Now for many, this is a common situation where caffeine seems to be the only cure. But there is a better cure for lagging concentration and emerging physical discomfort. 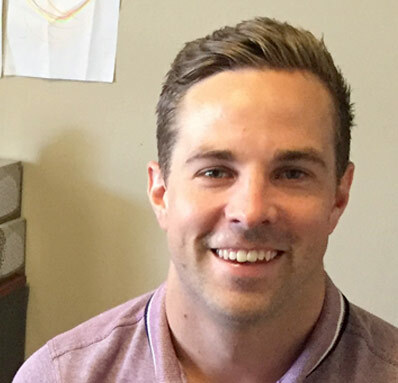 We at The Osteopaths of Heidelberg and Blackburn would like to share some proved ways that can improve concentration and avoid pain when working at the desk. We know from our experience and from the research that by targeting three things: stretching, hydration and posture, you will get through your working day feeling mentally and physically better. In this three part series, the three keys to getting through the day energised will be covered. In part one, I will explain easy tips to stay on top of your office stretching. Rejuvenating your muscles is a great way to energise both body and mind. Simply stretching different muscles around the head, neck and shoulders can significantly increase fluid movement to the brain and reduces muscle tension. Goodbye headache! Stretching is a very easy task and can be done anywhere. Identifying times or cues to stretch are just as important as the act of stretching, whether it be when reading a long email, sitting in a meeting or simply standing up from your desk and going for a quick walk around the office. All these times present themselves throughout the day, we just need to make the most of them! I’d like to highlight a few easy stretches that can be performed at a desk or while sitting. Each are targeted to release muscles prone to tension or which cause the dreaded tension headache. REMEMBER: Make sure you hold your stretches for at least 30 seconds! Trapezius: The trapezius muscle or ‘traps’ is a common muscle for holding tension and stress in the shoulder and neck area. Releasing through the traps enables greater neck and shoulder range of motion whilst also enabling adequate blood flow to the brain. When stretching the right trapezius, simply drop your right hand down by your side and allow your right shoulder to drop low. With your left hand, place the palm of your hand on the back right corner of your head. With gentle pressure, slowly pull the head towards your left leg. This stretch needs to remain comfortable and to be held for at least 30 seconds. A gradual and comfortable stretch needs to be held before repeating the same exercise to the opposite side. Slightly altering the direction you pull your head enables different fibres and portions of the muscle to be stretched. Chest: You’re sitting at your desk, shoulders slumped and your chest is caving in. This is common desk disease behaviour and leads to huge strains and dysfunctions in both the front and back portions of your upper body. So the next time a large email comes through from your boss, open it up, start reading and you can perform this stretch with no issues. A slight stretch will be felt through the front of your shoulders. Stretching through your chest will mean your breathing and posture improve significantly for the rest of the day! Shoulders: You’ve spent the past 6 hours at your desk with your shoulders rolled forward so what do you do? You roll them back with this exercise! Arms by your side, draw small circles with your shoulders. When your shoulders are at their highest point, pinch your shoulder blades together as your shoulders rotate backwards. This engages your back muscles to keep those shoulders square for the rest of the day! Neck: One muscle, located at the front of the neck, can drag the head forward and has the ability to trigger pain into the head. Releasing this muscle enables greater neck freedom and prevents excessive forward head carriage. When releasing this muscle, it may appear to the public eye you are milking your own neck. Do not worry, it is effective and I’m not making you look like the office idiot! Pinch the muscle with your thumb and fingers. Press only hard enough that it feels comfortable. Milk the muscle (yes milk the muscle!) with short repeated up and down strokes, start in the middle and work your way up and down the muscle. If you find a spot that hurts (and you will! ), gently pinch it harder and hold not forgetting to breath. Once the pain is bearable, slowly increase the pressure over 60 to 90 seconds. So next time you are fatigued and hoping for the day to be over, try some of these stretches! But remember, if any of these aches or pains continue, please consult with your osteopath at The Osteopaths of Heidelberg and Blackburn. We are always here to help! In my next instalment of getting through those office aches and pains, I will be covering how adequate hydration is a key component to staying energised at work. 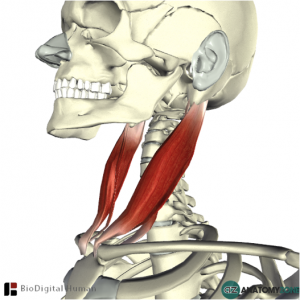 Image – Anatomy Zone, Viewed August 2016 <http://anatomyzone.com/wp-content/uploads/2014/10/sternocleidomastoid1.png>. Desk disease Part 2: The importance of adequate hydration!